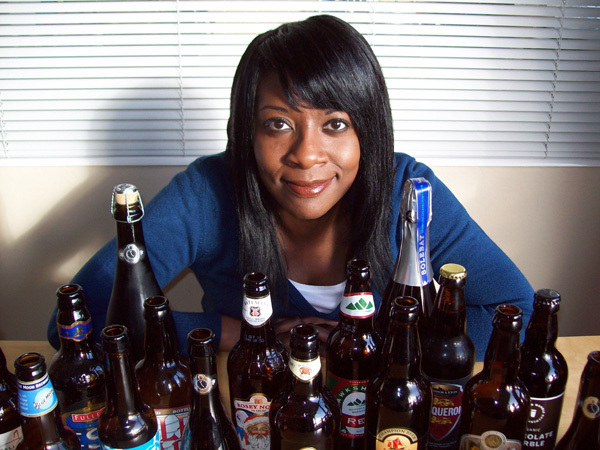 Beauty and the Yeast: catching up with Beer Beauty’s Marverine Cole | It Comes In Pints? This week ICIP has been lucky enough to chat to another of their beery heroes – Marverine Cole of Beer Beauty. Marverine is one of the eight female Beer Sommeliers in the UK as well as an award-winning beer writer, TV presenter and journalist, so we were very excited to ask her a few questions about her love of beer and her recommendations for our boozy Christmas lists. It Comes In Pints: We read that you used to be a red wine drinker. Did you have one pint that caused an epiphany or was your love of beer a slow development? Marverine Cole: It was one sip from a half pint of Beartown Brewery’s Peach Melbear which switched a light blub on in my head. I was hooked on finding other tasty beers with such impact ever since that day. ICIP: You are a bit of a trailblazer for women who love beer – the first woman to win a gold award at British Guild of Beer Writers, one of only 8 female beer sommeliers in the UK – have you seen things open up for women beer fans since you’ve started being interested in beer? MC: I think blogs like yours show there’s a real thirst for beer amongst women. We want to know more about it and where we can get hold of some good stuff! The fact that I’ve appeared on female-focussed shows like The Alan Titchmarsh Show and This Morning with Holly Willoughby openly exclaiming her love of beer shows the tide is turning. I’m hugely excited by the fact that more and more women are getting interested. The Cask Ale Report also shows there’s an army of women who regularly enjoy cask ale too. ICIP: You write a lot on your website, Beer Beauty, about how you love to convert women to beer. How do you go about introducing a die-hard wine and spirit drinker to beer? Is there a style or brand you tend to start them with? MC: I’ve never been one to say forsake all other drinks and drink beer. I still enjoy red wine and I love gin and vodka. I drink what I fancy when I fancy, although the social situations you’re in and the people you’re with might change the playing field. I would start anyone on Fuller’s Honeydew – the sweetness of the organic honey coupled with the light bitterness and the punch of it being a 5% beer ticks many boxes for women who are beer-curious. The rich golden colour, the aroma, the taste and the alcoholic kick all nod towards a female palette – we like strong drinks with something about them. We don’t all want a pale, weak tasteless ales – of which there are many on the market, sadly. I think it’s more about making suggestions to women of beers I’ve loved and like the taste of in the hope that they will experiment and try some. I have a Top Ten Beers for Brew-bies on my website which is my Starter For Ten for anyone – male or female – who wants an idea of where to start. ICIP: What are the most common misconceptions you hear from women about beer? MC: That it’s fattening, is full of calories and fat and cholesterol and that all beers are bitter. ICIP: You must taste hundreds of beers, but do you have a personal favourite style or type of beer that you hanker after? MC: I often can’t say no to an Imperial Russian Stout! ICIP: What breweries do you think are making the most exciting and delicious beer at the moment? Do you have any beers that you would recommend? MC: I love Beavertown Brewery in Hackney – terrific beers, superb hook up with Dukes Brew & Que and, of course, the West Midlands connection tugs at my heartstrings too because Logan is a Midlander, like me. I love Sadler’s Ales from the Black Country – their Mud City Stout is extraordinary. I think Crate, another Hackney brewery is pretty happening at the moment too. ICIP: As a beer sommelier you know a lot about beer and food matching – can you explain some of the basic principles of pairing food and beer for a novice? MC: I always aim for a beer to compliment food and not contrast or fight it. But it obviously depends on the flavour explosion you want in your mouth. I think the less pronounced the spice or bitterness in a beer, the more versatile it will be. I love a good clean Pilsner-style beer with herby pork loin, whereas a really hard-hitting bitter IPA will nestle perfectly next to a spicy Thai curry. A fruity beer might work well with a dessert – I always like to pair something like a Belgian cherry wheat beer with a sour, sharp cherry tart, maybe with swirls of chocolate on the top or served with chocolate ice-cream! ICIP: What beers are on your Christmas list? Are there any beers you can recommend to match with Christmas fare? MC: The best and most versatile recommendation for a Xmas table beer is Bosteel’s Deus at 11.5%, which I took on This Morning last year. Produced in the way Champagne is, it’s pineapple-like on the nose, with champagne like bubbles in the glass. Serve it in a flute; it’s so special that it works with both the spiciest of meals and the most delicate of flavours. Get it from a specialist beer store. Ask them to order it in NOW! As for others – I’m waiting for a few more Christmas beers to arrive but I’ve been wowed by both the limited edition Thornbridge Imperial Raspberry Stout (10%) and the BoxSteam Brewery’s Evening Star (7.5%) – a new strong dark porter from them. This entry was posted in Interviews, Women and beer and tagged Beer, Christmas, Marverine Cole on 19/11/2013 by icipints.